When taking a detour through the woods be sure to have your wits about you. For in the dark dark woods there lies a danger, Microgaming have chronicled it for you. So, it is time for you to get up to speed and learn all about Wicked Tales: Dark Red. Otherwise you may meet your doom and never return to the safety of home again! 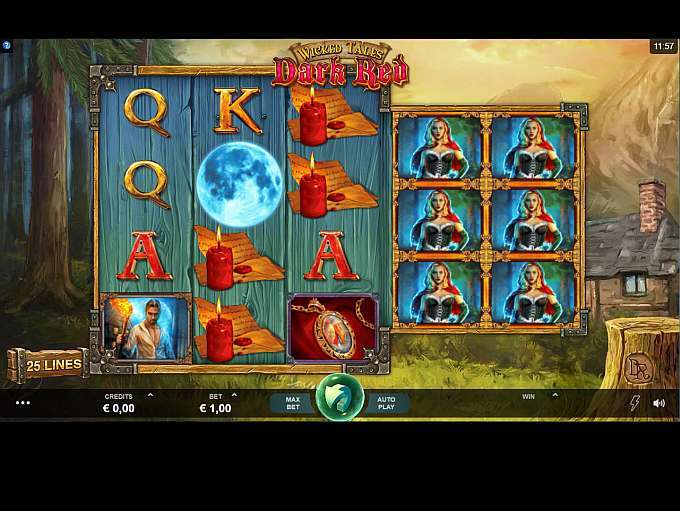 Wicked Tales: Dark Red is a 5-reel slot with 25 fixed pay lines, played across a three and four row set up that may seem familiar from previous games. It offers an RTP of 96.10% which is definitely not something to cry wolf about. Reels spin across a fairy tale picture background, showing a hunter’s cottage and the forest itself. Symbols are taken from the tale of Little Red Riding Hood, which the game is loosely based upon. Notice the higher value symbols are Red Riding Hood, the Hunter, the Wolf and a pendant. With lower symbols formed from the card denominations A, K, Q, J as well as a bag of gold and a melting candle. Bet Amounts – Betting on Wicked Tales: Dark Red begins at 25p per spin and can be increased to the maximum of £200 per spin. To adjust the bet amount, you can move the sliders up or down on the coin amount and coin size until your reach your required stake. Wild Symbol – The Wicked Tales: Dark Red logo is your wild symbol and it will substitute for all other symbols except the scatter. It is also your joint highest paying symbol in the game along with Red Riding Hood. Both of these symbols will pay out between x5 your coin win to x4000 your coin win, for landing 5 symbols on a winning line. The pay-out is dependant upon the stake at the time of the line win. Scatter Symbol – As you would expect from this tale the scatter symbol is the full moon. Landing three or more of these on Wicked Tales: Dark Red will trigger the bonus feature. 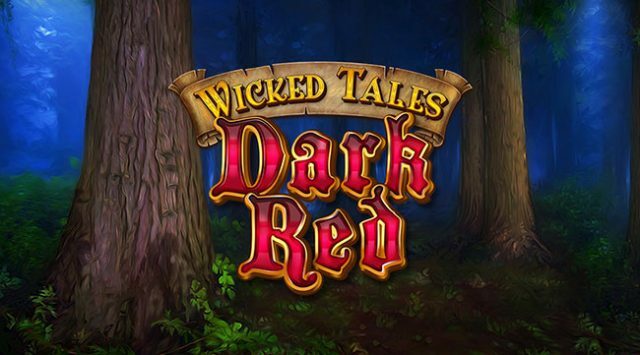 Game Features – Wicked Tales: Dark Red has two very distinctive features that you may recognise. They both make for very interesting gameplay and we have outlined them both for you to understand. Wandering Reels – you may notice that the reels change shape as they spin? This is because in this game every time the reels spin, they will move across to one of three different positions. And each time it does the new reel included in the set will expand upwards and downwards, to add an extra row at the top and bottom. It means that you will always have x2 rows of 3 and x3 rows of 4 in play, but they will chop and change as the reels move across the set positions. Jumbo Blocks – the great thing about the wandering reels, is that the set of x3 reels with x4 rows on is always inside a box. That means that on any spin at any time a jumbo symbol could land. This is a 4×3 block of the same symbol forming one large one. When this lands it will potentially bring much bigger wins. Full Moon Feature – Whilst most games feature a bonus spins round, Microgaming wanted something a little different for Wicked Tales: Dark Red. So, land yourself three full moon scatter symbols to trigger the feature first and then you will be taken to a new screen. Here you will be presented with a wheel of fortune to spin. It will hold cash prize amounts and the option of two mini features. Just keep spinning the wheel racking up prize amounts until you land on one of the two features. Whichever you land on will end the prize play and begin the game. Forest of Fortunes – in this mini game you will be given the choice of a number of bags. Each one will hold either an axe, wolf or a cash sum. Pick a wolf and the round is over, because you have just been eaten! But pick an axe and it gives you an extra go. Or pick a cash sum and you get to go again, but with the added extra of a x1 multiplier for every subsequent cash sum pick! Choose wisely, you need to avoid that hungry wolf! Bonus Spins Round – to trigger this you need to land one of the four higher value symbols when spinning the wheel. Once you do this you will be awarded 9 bonus reel spins and the symbol you landed on the wheel of fortune, will replace all the other higher value symbols during the round. The wandering reels is also still in play during this round meaning that you could be in with the chance of landing some high paying jumbo blocks if you are lucky. Well, we didn’t expect that when we first opened up the game. To be honest now, if the original tale of Red Riding Hood was as dark as this game makes out, we probably would have taken more notice, wouldn’t we? Wicked Tales: Dark Red is a great game, graphics are a bit murky in places, but that can be forgiven considering the wins we took in both the base and the bonus games. We weren’t entirely sure how a wheel of fortune would fit in with the game, but it seemed to work, and we liked the twist of landing one or the other features as it gave it a bit more intrigue.